Out and About" is a an ongoing project I throw out there to document some of the unique, quirky and/or totally fabulous aspects of living in the fair city of Bermtopia. Oh. And I should mention I don't get paid to write about these joints. (Does this blog look like we get paid to write about anything? Some day, you'll thank me. I am a total car wash geek. There. I've said it. I love car washes. As a kid, the high point of my 6-year-old day was when my mom took me with her to get her blue Nash Rambler washed at the local self-serve. I loved the physics-defying (in my mind) metal track and pulley that hauled vehicles through the watery gauntlet of jumbo brushes and mops. I loved watching the car wash soap sea-foam across the car windows, filling all the mysterious nooks and crannies of windshield and hood. And I loved the car's subtle shudder -- akin to someone giving me a gentle shove to wake up -- when the steaming, lazer-like streams of rinse water hit the sides of our car. Things haven't changed much in 53 years. I just can't help myself. I love car washes. I'm sure there's medical explanation for it. And speaking of car washes. . . the best car wash, the Xanadu of car washes, the Valhalla of car washes, the Machu Pichu of all car washes, is Bermtopia's own Mister Car Wash perched between Division-Ruby Street couplet just a wash rag's throw from the South Hill. 10. Khaki and polo shirts: Winter, spring, summer, fall you'll find Mister Car Wash attendants decked out in jaunty Mister Car Wash polos and khakis. It's sort of like pulling into a country club for dirty cars. 8. Drive-through or full-serve? Unless I am in a bodacious hurry, which I generally try to avoid at all cost, I use full-serve. Have you lost sight of that fine Corinthian leather in the haze of dog hair and Egg McMuffin crumbs you call the interior of your car? Gone with a wave of a Mister Car Wash power vac. Do small birds stick to your windshield because of the pitch you've accumulated thanks to the 100-foot pine tree growing right next to your driveway? The small army of Mister Car Wash car dry-ers and polishers who swarm your car as it emerges from the wash can take care of the majority of deposits -- and recommend product for the stubborn ones that remain. 6. Greeting cards: Why stop at the pine-scented air freshener shaped like a Christmas tree? 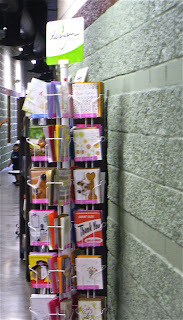 Pick up a few Christmas cards as well at the Mister Car Wash gift shop while you're at it. Boo-yah! Note the Mister Car Wash T-shirt. That's the Summer Look. 4. Professionalism: Don't worry about the messy state of your car. Mister Car Wash attendants are unflappable. They have seen everything. Well, almost everything. 2. And, oh, have I mentioned Mister Car Wash provides FREE POP CORN? 1. 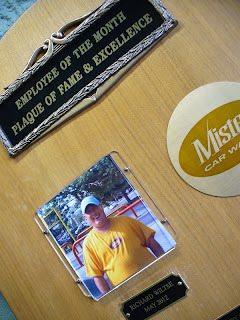 But the number-one reason why Mister Car Wash is bomb-est of the bomb? They sell ART -- in the restrooms to boot. Don't know about you, but I'm always on the look-out for eye-catching etchings when I'm in the loo. The concept is nothing short of genius. Mister Car Wash is nothing short of genius. Mr. Carwash is da bomb! I take my 2 young kids, sit in the drivers seat and read while they "vacuums" and then we either partake of the popcorn and watch the car go through or we ride in the car and they are allowed to have a dance party out of their seats. It can kill up to 45 minutes in the winter - a total score. And seriously, who doesn't love free popcorn!? Hmmmm. Dance party in the back seat? Note to self. @Maria, you are right! 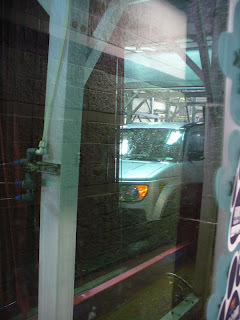 Like any other business, people in the car wash industry also have their cool strategies in order to attract customers. Well, the local car wash that we have here in our area always has great promos going on. They give away coupons that offer discounts. Their latest one is that once you purchase one of their packages, you’ll get to have an extra service free.